Mistakes to Avoid with Your New Kitchen Design | Affordable Granite & Cabinetry Outlet Inc. Taking on a kitchen remodel is an exciting time in your life. However, you do not want your new kitchen design in Newburgh or any of the surrounding areas to be marred by easily avoidable mistakes. 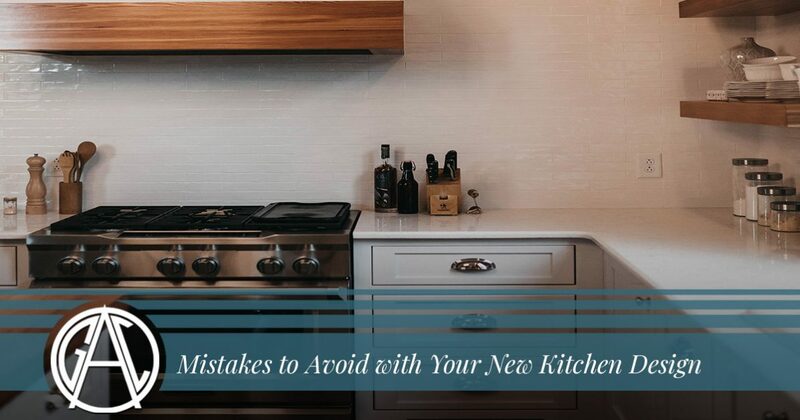 Omitting countertop space and purchasing subpar appliances are some of the most common mistakes you might encounter, and we’ll explain more about these mistakes below. Affordable Granite & Cabinetry Outlet is here to provide you with friendly and professional kitchen remodeling services that will bring your dreams to life. Whether you’re taking on a small remodel with minor updates, or a full kitchen renovation that truly transforms your home, we’ll work closely with you to create the space you’ve always wanted. Call 877-778-2372 or use our online contact form to get started! Your kitchen is one of the most crucial storage areas in your home. You likely have several appliances, kitchen utensils, spices, dry ingredients, perishable foods, and so much more housed in your kitchen. During the kitchen design process, look for ways to increase your storage space and make your workflow more efficient. If you want different ways to minimize clutter, then ask your kitchen designer about innovative, modern storage solutions. There are many unique and inventive storage solutions available, such as hanging shelves inside your cabinets, lazy Susans, and layered compartments in kitchen drawers. You should also keep in mind your current and future storage needs when you’re designing your new cabinets. If you have young children, then you may want to opt for bigger cabinets that can accommodate growing appetites. On the other hand, households with children who will be leaving for college can likely get away with choosing smaller, sleeker cabinets without as much extra storage space. Counter space is one of the most important elements of your kitchen design. Whether you use your counters to hold appliances, prepare food, or both, there should be an ample amount of available space. Your granite countertops can come in a variety of colors and designs to suit your kitchen decor, and you should consider where your kitchen could benefit from additional space. 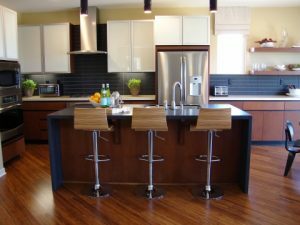 If you do not have ample counter space already built in, then you might want to consider installing a kitchen island. You can even turn the space into a small countertop bar that can be used when you need extra seating. Consider utilizing other areas of your kitchen for extended shelving that is strong enough to support food preparation, appliances, or spice storage. Even one or two extra shelves can make food preparation and cooking much easier! When remodeling your kitchen, it is safe to assume that your kitchen’s design will not be changed in the foreseeable future. Therefore, this is no time to skimp on your necessary kitchen appliances. Your refrigerator, oven, and dishwasher should be high-quality and rated to last for several years. If you choose subpar appliances, then you will end up spending much more money on repairs and replacement costs within a short period of time. At the end of the day, spending a bit more on exceptional appliances will be well worth the investment, and you won’t even notice the financial difference after a few months have gone by. We know that beginning a kitchen remodel is exciting, but you should be wary of making hasty decisions. You’re making a big commitment and a significant investment, so make sure that each and every detail is something that you’ll be happy with for as long as you remain in your home. We recommend making a small list of designs and products you like, and then coming back to the list several days later to review your choices. Often, you’ll find that in-the-moment choices aren’t as attractive when you look at them in retrospect. It’s easy to get caught up in the glamor and excitement of choosing new granite countertops and gorgeous new cabinetry, but you shouldn’t forget about the lighting in your kitchen. Undercabinet task lighting can make it easier to prepare food and see what you’re doing while you cook, and accent lights above your new kitchen island can add a touch of elegance and class to your space. Just ask our kitchen remodeling experts for advice if you’re not sure where to begin when it comes to lighting! Keep an eye on our blog page, as we’ll be adding more information about kitchen renovations in the coming weeks and months. In the meantime, fill out the form below to get started with a kitchen remodel in your Newburgh home!